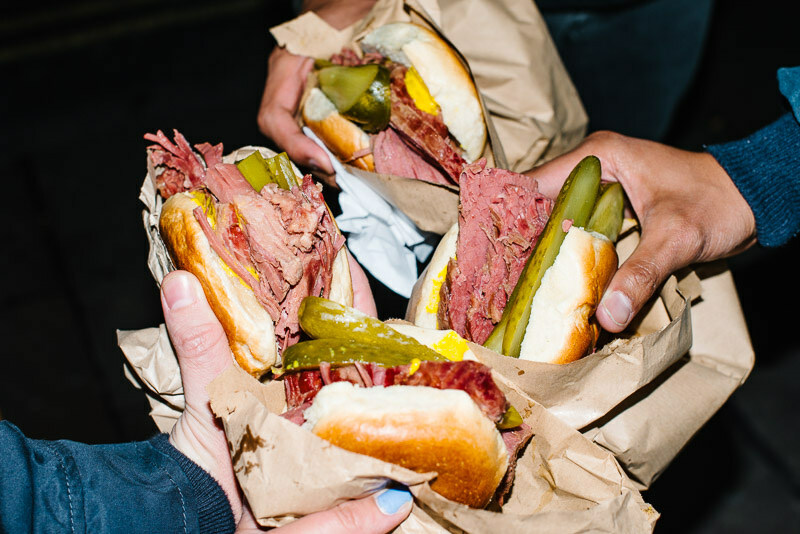 Beigel Bake is a 24 hour Jewish bakery on Brick Lane and has been around since 1977. They serve bagels and pastries round the clock, the crowd changing in character depending on the time – Shoreditch locals in the early evening, clubbers a little later on and taxi drivers in the early morning hours. This is a light that never goes out. Their menu is extensive and affordable – jam donuts, Eccles cakes, croissants, apple turnovers, a myriad of slices, cakes and muffins. Buttery slabs and scrolls of glazed dough are forced up against the display like abstract brickwork, loaves and loaves line the shelves behind the counter and bagels are boiled in the steamy kitchen out the back (they churn out over 700 per day). We could all draw comparisons to our local bakery with their frog cakes and ham and cheese rolls, but Beigel Bake offers something far more fantastical. The hot salt beef bagel. Low and slow cooking has slipped into modern restaurant haiku, a pox on those who actually do it well as bandwagoning establishments dilute the pool of well-tended-to meat with subpar offerings flaunting faux-Texan typefaces. But not here. At Beigel Bake large briskets are boiled for hours until they emerge dripping wet and are then thrown onto the pass and are carved, no, hacked apart by the gentle stroke of a large knife – the hot salt beef surrunders like butter. The beef is then generously tossed into a sliced bagel boasting an out of this world bread-to-meat ratio with mustard (pickles optional), and you are thrust outside, or onto the cold steel bar behind you, as you’re left to your own devices with the most succulent sandwich that exists on this godforsaken planet. All this for £3.70. The wonderous meat chopping is visible from the storefront, and friends and I gathered watching the majesty unfolding as if we were basking before one of the many wonders of the world. This was after we’d already eaten. At 8pm people were spilling outside brandishing either bagels or cakes beneath the sign that reads “HOT BEIGELS ALL NIGHT”. Three doors down sits Beigel Shop (or, “the yellow one”). I’m not sure if their rivalry is friendly or at comical levels of a mortal enemy situation unfolding for years, but sadly for them Beigel Bake reigns supreme on the popularity front. A perfect evening was spent as four friends devoured the softest meat. It was carnage. I want more Hot Beigel Nights. The above is an excerpt from Holiday Notes: Notes From a Holiday.